We’ve heard all of these statements—and we get it. Running a business requires a lot of time and energy. And sometimes, the first casualty of all the busy-ness is a comprehensive marketing strategy. There’s barely enough bandwidth to do what your business does, much less to talk about it. Our friends at LuxCraft were experiencing this very tension. Makers of fine outdoor poly furniture and structures (gazebos, pavilions, and pergolas), they were faced with an enviable problem: how to keep developing new products and support an ever-widening nationwide dealer network while taking their marketing efforts to the next level. They turned to Cassel Bear with a request that we serve as their marketing department, developing and executing a comprehensive marketing strategy so that they could focus on furniture. Our first major task was to invigorate the LuxCraft brand. 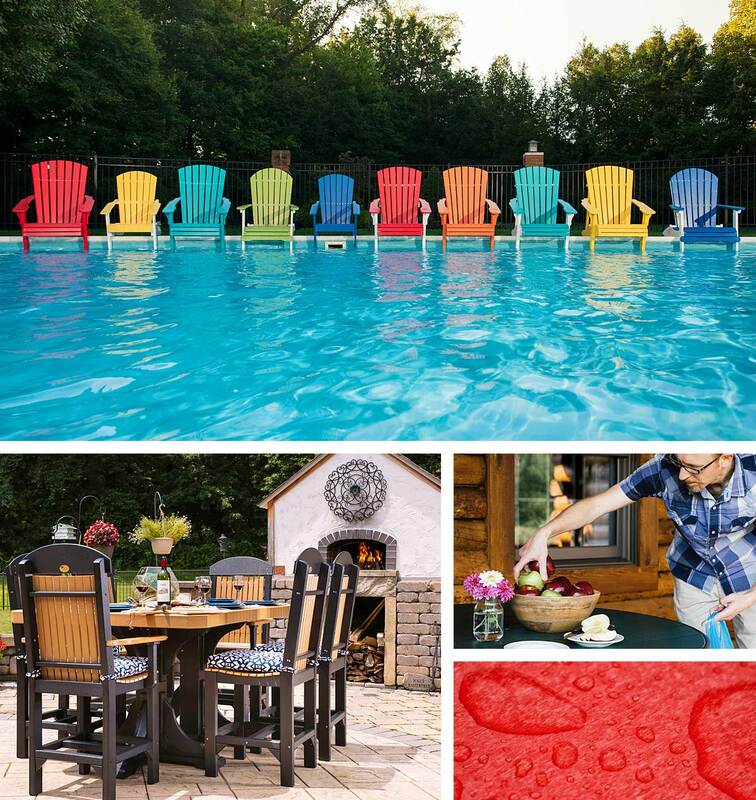 While their furniture is colorful, easy to clean, environmentally friendly, and durable, the photography of the pieces simply didn’t “wow.” The existing photos were serviceable—showed the products clearly—but didn’t convey the “feel” of the pieces—the leisurely summer lifestyle they’d offer the owner, the class and sophistication they could bring to a patio, and the fun and whimsy inherent in a variety of color options. We captured new images of almost every piece in the LuxCraft line. Not only did the shoot call upon both our administrative (finding and scouting locations, developing shot lists, keeping track of multiple sizes, dimensions, and options) and creative (dressing each shot with props and décor, brainstorming artful “concept shots”) skills, it furnished us with the building blocks for our next marketing pieces. While LuxCraft possessed a functional website for its dealers, the company had never really focused on a consumer-based online presence. Our Cassel Bear team developed a robust website that allows consumers to see every piece in every color option, think through how they want to build an outdoor structure, locate dealers close to them, and much more. Within a few weeks of going live, the site’s Google Analytics were off the chart! The new website also allowed us to develop a visual style—bold fonts, color blocks, color gradients, geometric shapes, and pull quotes—which was then introduced in print pieces across the brand. 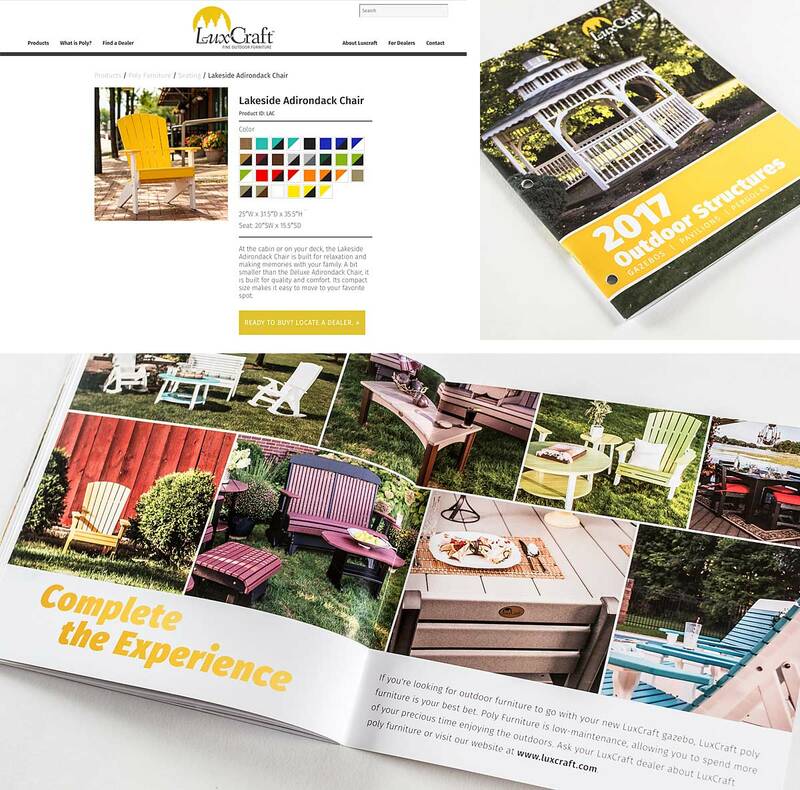 Our major print effort was a re-invention of the LuxCraft catalogs—both a comprehensive dealer version and more streamlined consumer version—for both poly furniture and outdoor structures. A more recent focus of our strategy has been to create tools and resources for dealers to better enable their sales initiatives. A new Facebook presence allows LuxCraft to post daily photos, cleaning tips, and more that dealers can then offer to their clients through their own Facebook pages. We’ve also crafted a number of in-store materials to draw more attention to LuxCraft products. Dealers can utilize huge feather flags to grab the gaze of potential clients as they drive by. A sell sheet and signage create energy around LuxCraft’s newest modification—poly that looks and feels just like natural wood grain. And for the first time, LuxCraft pieces will now carry distinctive furniture tags that both convey the lifestyle associated with the product, while also offering consumers some helpful cleaning tips. The happy ending to the story? LuxCraft now has a marketing team at Cassel Bear focused on doing what we do well—telling the story of a business to a growing audience—so that they can do what they do well—craft some of the finest poly furniture in in the industry.